“I’m In” is a campaign founded by the National Minority Quality Forum (the “Forum,” “we,” or “us”) and the Pharmaceutical Research and Manufacturers of America​ (“PhRMA”) to improve health by increasing clinical trial participation among traditionally underrepresented populations through advocacy, education, and technology. When patients, investigators, or advocates join the campaign and submit information, the Forum collects and maintains that information in the Network. The Network is an internet-based environment operated by the Forum that connects patients, clinical trial sponsors, clinical investigators, health care professionals, their institutions, and advocacy organizations across the nation. Only organizations that have entered into a separate agreement with the Forum (“Network Members”) may access information contained in the Network that we have collected from patients, investigators, and advocates. PhRMA does not participate in the operation of the Network. We also may use information that does not describe or identify individual users, such as aggregate website usage data or demographic reports, for a variety of purposes, including conducting clinical-trial-related research. Service Providers. We may share your information with service providers that perform certain functions or services on our behalf, such as to host the Services, manage databases, perform analyses, or send communications for us. Other Network Members. 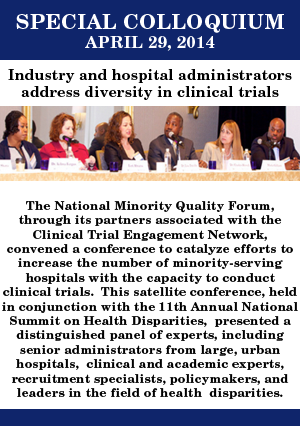 We may share your information with Network Members to facilitate underrepresented populations’ participation in clinical trials. If PhRMA becomes a Network Member, we may share information with PhRMA that we would share with other Network Members. Other Parties With Your Consent. We may share information about you with third parties when you consent. Aggregate Information. We may disclose to PhRMA or third parties information that does not describe or identify individual users, such as aggregate website usage data or demographic reports. PhRMA and the Forum may allow third parties to place and read their own cookies, web beacons, Local Shared Objects, and similar technologies to collect information through parts of the Services other than the Network. Only the Forum may allow third parties to place and read their own cookies, web beacons, Local Shared Objects, and similar technologies to collect information through the Network. For example, third-party service providers may use these technologies to collect information that helps with traffic measurement, research, and analytics. Local Shared Objects (sometimes referred to as “Flash Cookies”) are similar to standard cookies except that they can be larger and are downloaded to a computer or mobile device by the Adobe Flash media player. Please note that you may need to take additional steps beyond changing your browser settings to refuse or disable Local Shared Objects and similar technologies. For example, Local Shared Objects can be controlled through the instructions on Adobe’s Setting Manager page. If you choose to refuse, disable, or delete these technologies, some of the functionality of the Services may no longer be available to you. Reasonable security procedures are in place to help protect against loss, misuse, unauthorized access, disclosure, alteration or destruction of the information you provide to us. Please note that no data transmission or storage can be guaranteed to be 100% secure. As a result, while we strive to protect your information and privacy, neither the Forum nor PhRMA can guarantee or warrant the security of any information you disclose or transmit to the Forum online and cannot be responsible for the theft, destruction, or inadvertent disclosure of your information. The Services do not knowingly collect, use, or disclose personal information from children under the age of 13. We and PhRMA have worked with certain third-party social media providers to offer you their social networking services through the Services. For example, you can use third-party social networking services, including but not limited to Facebook, Twitter, and others to share information about your experience on the Services with your friends and followers on those social networking services. These social networking services may be able to collect information about you, including your activity on the Services. These third-party social networking services also may notify your friends, both on the Services and on the social networking services themselves, that you are a user of the Services or about your use of the Services, in accordance with applicable law and their own privacy policies. If you choose to access or make use of third-party social networking services, we may receive information about you that you have made available to those social networking services, including information about your contacts on those social networking services. Some web browsers may transmit “do-not-track” signals to the websites with which the user communicates. Because of differences in how web browsers incorporate and activate this feature, it is not always clear whether users intend for these signals to be transmitted, or whether they even are aware of them. Because there currently is no industry standard concerning what, if anything, websites should do when they receive such signals, we and PhRMA currently do not take action in response to these signals. If and when a final standard is established and accepted, we will reassess how to respond to these signals. You may receive promotional emails, newsletters, and similar communications from us. You may opt out of receiving commercial emails by clicking on the opt-out or “unsubscribe” link included in the commercial e-mails you receive. Please note that opt-out requests may take up to 10 business days to be effective. Your opt-out request will not apply to messages that you request or that are not commercial in nature. If you have created an account through the Services and would like to deactivate it, you may email support@joinimin.org. We will send you an email confirming deactivation of your account. If you would like to correct or update your information, you may log in and edit your profile on the Services. Last Updated: March 12, 2014.